Whenever a process utilizes a lot of system resources, it loads the RAM. In general, I advise all my reader that a Windows 10 system should typically have 4GB of RAM instead of the usual 2GB. However, even if you have enough RAM, high-end games use a lot of resources. The disk utilisation could be checked through the Task manager. 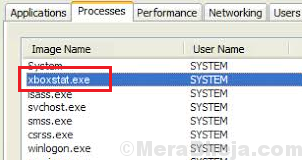 In many cases, users have reported the xboxstat.exe utilising a large fraction of the system’s resources. The disk utilisation remains high because of this process. When we connect an Xbox 360 controller to the system, it initiates the xboxstat.exe task. Rather, it would initiate every time we boot the system. This task is not needed for the functioning of the controller and can thus be ended. It is simply used to collect statistical data from the system and send it to Microsoft. How to end the xboxstat.exe task? 1] Press CTRL+ALT+DEL to open the Security options window. 2] Select and open Task manager from the list. 3] In the Startup tab, scroll and locate Microsoft Xbox 360 Accessories. Click on it to select it. 4] Click on Disable at the bottom of the Task manager window. This way, it won’t initiate after restarting the system. 5] Reboot the system to verify the same.